Good morning, I wanted to share with you a tip that can change your life. Many times when people reach the goals that they set, they stop and feel like they have made it. 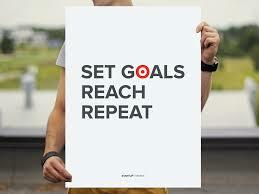 I am encouraging you to set goal, reach goals and repeat goals. Because what I have found is most people can do more. Most people just stop right at the top of the requirement. Go back to your goal and do it again, you will find that you can BLOW IT OUT THE WATER when you intentionally decide that you are going to do it again. As long as you still believe in yourself, you can SET GOALS, REACH and REPEAT.